We asked Mark Allison, the Manager of Strategic Initiatives and Sustainability for the City of New Westminster—who is also an active environmentally-minded resident—to give us a primer on the City’s Waterfront vision, and some of the implications for residents and other stakeholders. This article first appeared in our August 2016 print edition. What is our ‘Waterfront’? Condominiums? An urban beach? An esplanade? An industrial area? Park land? A salmon-bearing river? A railway corridor? A truck route? A marine highway? A greenway? Sapperton? Brunette Creek? Downtown? The Quay? North Arm? Queensborough? Of course the answer is all of the above, and much more. There are few places in the city where the water is not close by or visible. The Fraser River has always been a highway of commerce and cultural exchange starting informally with the region’s First Nations and early settlers and continuing with more regulated shipping. New Westminster’s strategic location in the 1860s overlooking the Fraser River has resulted in the city being at the centre of Metro Vancouver a century and a half later. One could argue that we are the west coast’s original river city and that without the river, there would be no New Westminster. New Westminster Public Library, accession number 278. 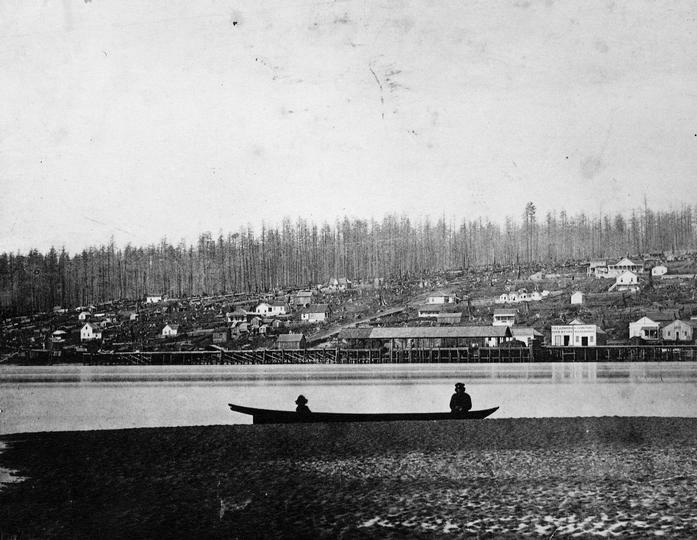 Photo is approximately circa 1865 and is a general view of New Westminster with a canoe in the foreground. …Front Street will be returned to a pedestrian-friendly retail street with historic storefronts. …seamless connectivity to the Waterfront will be achieved, allowing for barrier-free movements to the Waterfront and the Westminster Pier Park for pedestrians, cyclists and vehicles. …the Front Street Parkade will be replaced with new public parking in the Downtown. …the rail corridor will be cleaned up and train whistles will be eliminated. …the City will seek to prohibit or restrict commercial truck traffic from Front Street. There is power in vision, and just five years later, the City has accomplished much of what it set out to achieve: a large section of Front Street has re-emerged after half a century under the shadow of a concrete parkade, an iconic new pedestrian and bicycle bridge connecting the Downtown to the Waterfront has been built at Fourth Street, construction will soon begin on Front Street Mews, a new pedestrian-oriented commercial street, and work is underway to achieve train whistle cessation along the city’s riverfront railways later this year. The Waterfront is the City’s most significant cultural, economic, and natural asset. It is home to vibrant and diverse public spaces, high-quality recreation, business and housing, and significant natural features. It is an integral component of the local economy, providing employment, services and tourism opportunities while providing a living link to the city’s past. Our Waterfront Vision is to seamlessly connect our riverfront – while respecting existing industry – through a continuous system of greenways and parks that run the length of the city and provide improved connections from our neighbourhoods to the river for residents, businesses and visitors alike. Along with enhanced access and facilities, the Waterfront’s recreation and tourism potential will be realized through public spaces and activities that generate widespread interest and are welcoming for all ages and abilities at all times during the year. 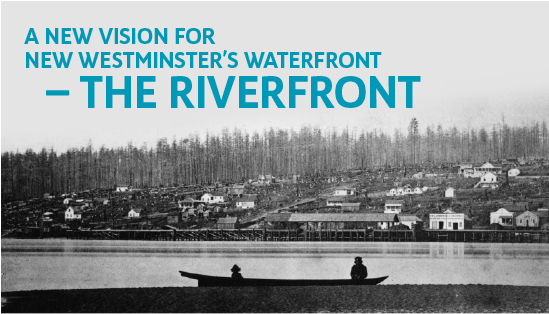 As part of a recent branding exercise to identify a name and graphic image to represent New Westminster, the City asked focus groups what characterized the Waterfront and what they wanted it to be. The response was there is no single Waterfront character; it is industrial, commercial, residential, recreational, natural, modern and historic. These co-existing characteristics make the city unique and diverse, and should be celebrated. 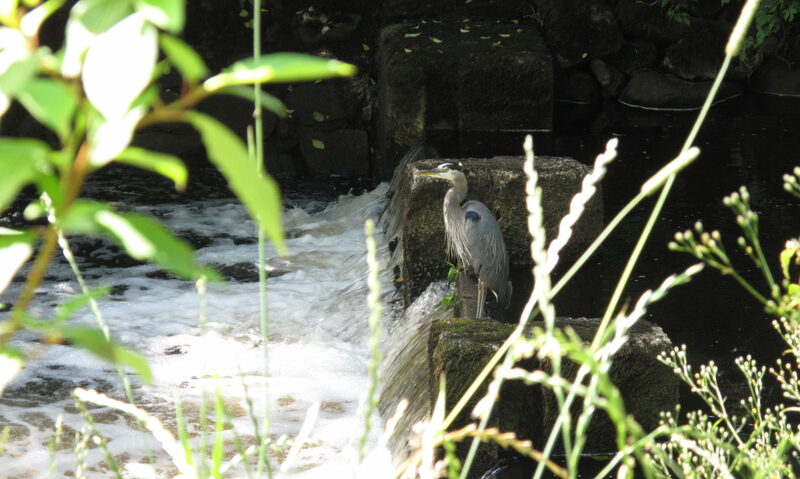 At the same time, residents and stakeholders made clear they want access to, and be connected to their river, as well as being able to enjoy both quiet and passive and active and animated places along the river. In fact, most didn’t think of the river frontage as the ‘Waterfront’ – that could be any body of water, anywhere. Our ‘Riverfront’ makes New Westminster unique. Continuity. Creating a continuous network of attractive greenways and parks. Connectivity. Providing connections from all city neighborhoods to the River. Activity. Programming and animation with an active, engaging and dynamic series of experiences compatible with existing industrial uses that entice visitors to explore its many destinations and adjacent amenities. In June, with Front Street closed to traffic, the City hosted ‘Pier 2 Landing’—a celebration of the Riverfront and new Waterfront Vision. 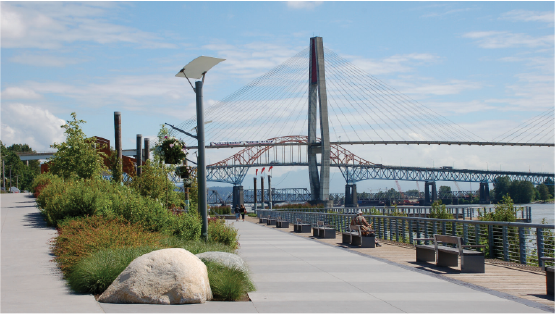 People walked or wheeled between Pier Park and Sapperton Landing without traffic, experiencing local visual and performing artists, enjoying safe play and crafts for children, learning to fish and ride bicycles, and getting a glimpse of what a continuous, connected, and active Riverfront might look like. What does the future hold for the Riverfront? 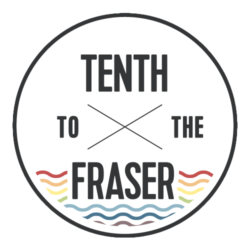 New Westminster’s designation as the ‘Urban Portal’ for Metro Vancouver’s Experience the Fraser trail network that spans from Hope to the Salish Sea perhaps says it best – it will be a place where local residents,employees, and visitors from around the region and world come to experience the Fraser and Brunette rivers in all their marvelous diversity. The only thing we want in New Westminster is an end to the damned train whistles that blast 24/7. If you are thinking of moving to New Westminster – DON’T. You will get no sleep – any night – and your stress levels will correspondingly hit the roof. The City says that ‘whistle cessation’ plans are underway but be warned – they are only going to be in-place at 2 of 13 whistle-blowing locations (the 2 being located in the so-called downtown location). If you live anywhere along Brunette Avenue (such as in Onni’s ‘new’ Victoria Hill development), from McBride going east, there are no whistle cessation plans. The noise for those residents will continue to be brutal. If you want sleep, DO NOT MOVE TO NEW WESTMINSTER.